kit in a Ford F150 Pickup. 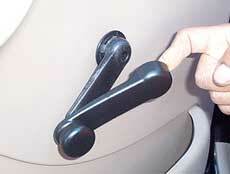 Next, the window crank handle is removed. The plastic cover is pulled back and the Torx screw that holds this handle to the shaft is removed. 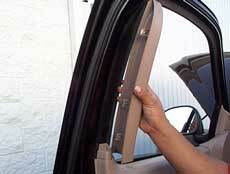 The remaining trim pieces at the top of the panel are carefully unclipped and removed from the door. 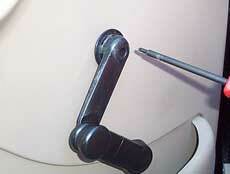 Our installer uses a forked door panel remover to remove these clips. 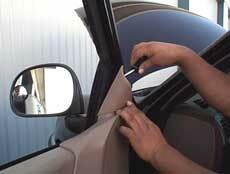 It is also possible to use a screwdriver or scraper blade to get at the clips. Ready to Order? Need Prices? Use our Online Catalog & Shopping Cart! We have thousands of items in stock and ready to ship!